The Laos aviation market, which has quietly more than doubled in size over the last 15 months, is poised for more rapid growth in 2013 as both of the country’s small carriers continue to expand their fleets and networks. Government-owned Lao Airlines, which added two A320s in 4Q2011 and a third A320 in 4Q2012, plans to take a fourth A320 and add two ATR 72-600s in 2013. Meanwhile, privately-owned start-up Lao Central Airlines plans to add three Sukhoi Superjet 100s in 2013, with the first aircraft due to be delivered in the coming weeks, to supplement its fleet of two Boeing 737-400s. Laos is also starting to attract increasing interest from foreign carriers as the relatively unpopulated and rural Southeast Asian country gradually emerges as a popular tourist destination. The upcoming opening of a new terminal at the historical town of Luang Prabang, where the runway was recently extended to accommodate jets, is expected to attract several international carriers. Only two foreign carriers now serve Luang Prabang and only six foreign carriers serve Laos overall, accounting for slightly less than 50% of the country’s total international capacity. Foreign carrier capacity could easily double over the next year or two, even with the Laos government reluctant to allow a significant influx of LCC capacity. The international capacity provided by the country’s two local carriers, both of which follow the full-service model, will also likely double over the next year or two as they are keen to profit from the growth in inbound tourism. More domestic growth is also expected but that will be more modest. 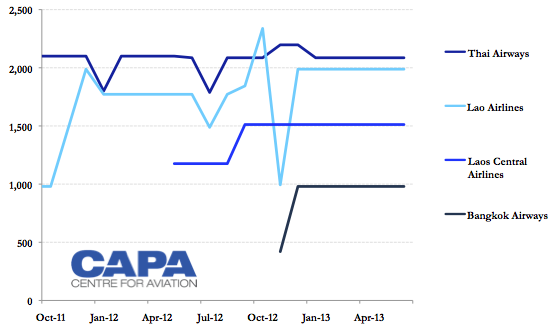 Laos is no longer the smallest aviation market in ASEAN, having surpassed Brunei over the last year. There are currently about 58,000 weekly system-wide seats in Laos, making it the ninth largest aviation market in ASEAN with 17,000 more seats than Brunei. Only 15 months ago, in Oct-2011, Laos had only 28,000 weekly seats including about 6,000 domestic seats and 22,000 international seats. The small domestic market has more than doubled to 16,000 seats while the international market has grown by about 90% to 42,000 seats. Most of the growth has been driven by the biggest expansion in the 37-year history of Lao Airlines and the launch of Lao Central Airlines, established by one of the wealthiest families and one of the biggest conglomerates in Laos. 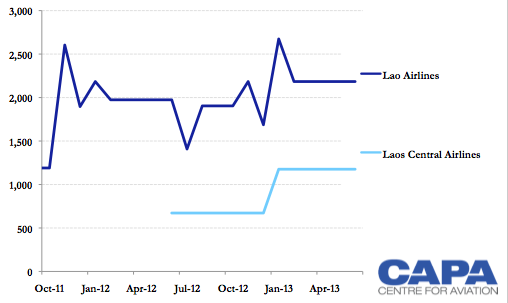 In a period of just over one year, the number of commercial jets registered in Laos increased from zero to five. In 2013 this will increase to at least nine – a drop in the bucket for most Asian markets but a huge figure for a country the size of Laos. At the same time foreign carriers have also been expanding into Laos. Bangkok Airways, which has been one of two foreign carriers serving Luang Prabang for several years, launched on 01-Dec-2012 a daily service to Vientiane from its Bangkok hub. Vientiane-Bangkok, which is by far the largest international route in Laos, had already seen an 80% increase in capacity driven by the launch of Lao Central and introduction of A320s at Lao Airlines. With Bangkok Airways’ entry, capacity on the route doubled in a 13-month window to about 6,500 one-way seats. The Vientiane-Bangkok now route accounts for over 30% of total international capacity to and from Laos. Not surprisingly the Vientiane-Bangkok route is now suffering the effects of over-capacity. But the four carriers on the route are optimistic all the added capacity will be absorbed within the short to medium-term as demand to and from Laos continues to increase rapidly. Thailand remains the biggest destination market for local Lao traffic as well as the largest single source of tourists. Of the 2.7 million tourist arrivals in Laos in 2011, 1.6 million were from neighbouring Thailand. Bangkok is also the main gateway for long-haul passengers and, as Laos continues to attract more tourists from Australia and Europe, demand on the Bangkok to Vientiane and Luang Prabang routes will continue to increase. Bangkok-Luang Prabang currently has about 1,500 one-way weekly seats and will likely see an increase in capacity by the end of 2013 as the Thai Airways Group aims to launch services on the route. However, new options for long-haul passengers heading to Laos are starting to open up as new routes such as Singapore and Seoul are launched and expanded. Hanoi has already emerged as an alternative gateway to Bangkok. Hanoi is the second largest international route after Bangkok for both Vientiane and Hanoi. Vietnam Airlines is now the largest foreign carrier in Laos, a position it is keen to maintain. Vietnam is also the second largest source market for tourists in Laos, with over 500,000 Vietnamese visiting Laos in 2011. Rapid change in the otherwise sleepy Laos aviation market started in early Nov-2011, when government-owned flag carrier Lao Airlines placed into service two A320s. The carrier previously only operated turboprop aircraft, which limited its ability to expand internationally. With its first two A320s, which were purchased directly from Airbus in low-density 126-seat configuration, the carrier’s total capacity shot up by about 90% practically overnight from about 14,700 to about 27,600 weekly seats. Similar rates of growth were pursued in the domestic and international markets, with Lao Airlines adding about 5,500 weekly seats in the latter and 7,400 weekly seats in the former. 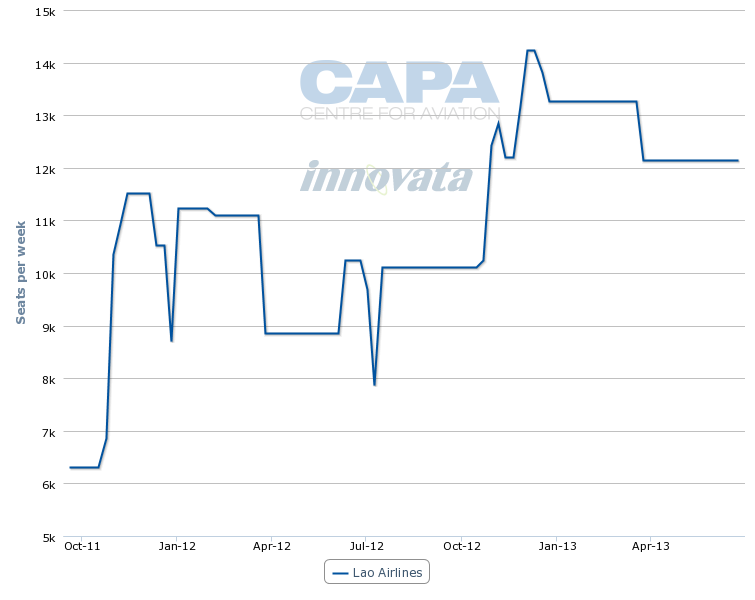 Lao Airlines in 2012 decided to lease two additional A320s, the first of which was delivered in Nov-2012. This resulted in a further capacity increase of about 16% to over 32,000 weekly seats and a total capacity increase since Oct-2011 of almost 120%. In the initial phase of its expansion in 4Q2011 Lao Airlines only launched one new route – Vientiane-Singapore – as the initial two A320s were primarily used to up-gauge existing routes including Vientiane to Bangkok, Kunming and Hanoi. With the third A320 Lao Airlines has been able to focus more on network expansion as service to Guangzhou, Busan and Seoul have been launched in recent weeks. Vientiane-Guangzhou launched on 29-Nov-2012 with three weekly flights while three times weekly Vientiane-Seoul service launched on 21-Dec-2012 followed by three times weekly Vientiane-Busan service on 23-Dec-2012. At about five hours, the two South Korean routes are by far the longest routes in the Lao Airlines network but for now are only available for sale as part of package tours. Lao Airlines also launched service on 04-Dec-2012 to Da Nang, the carrier’s third destination in Vietnam. The carrier is serving Da Nang from Pakse, the second largest city in Laos, with three weekly flights using ATR 72-500s. While Lao Airlines continues to use turboprops on some niche international routes, it was able to move most of its ATR 72 fleet to the domestic market as A320s replaced ATR 72s on its three largest international routes in 4Q2011. Lao Airlines doubled its ATR 72-500 fleet from two to four aircraft at about the same time the first two A320s arrived in 4Q2011 and has acquired two ATR 72-600s, which will be placed into service in 2013 and give the carrier a fleet of six ATR 72s. The carrier previously operated Chinese-built Xian MA60 turboprops in several domestic markets but has phased out the type from scheduled passenger operations and plans to convert the aircraft into freighters. Meanwhile, the second leased A320 is scheduled to be delivered in Mar-2013 and will be used to further grow Lao Airlines’ international network. The carrier has not yet announced a new batch of routes but has identified potential destinations in Japan, Indonesia, the Philippines and India. The fourth A320 will most likely be used primarily for international services with the two additional ATR 72s being mainly deployed domestically. Lao Central is also now in the final stages of evaluating several new potential destinations which it will launch after taking delivery of the first of at least six 93-seat Superjet 100s. The carrier sees the regional jet, which it will configure with 85 economy and eight business class seats, as the ideal size for opening new markets primarily in other Southeast Asian countries. Lao Central expects to take delivery of its first Superjet 100 in late Jan-2013 and place the aircraft into service in Mar-2013. 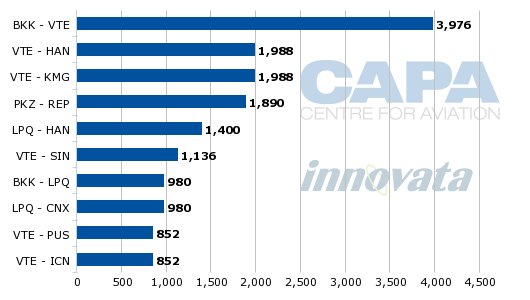 Two more aircraft are scheduled for delivery by mid-2013 while the last three aircraft on firm order are slated for delivery in 2014 and beyond. Lao Central also has options for three of the type. Lao Central launched services in May-2012 using two 737-400s configured with 144 economy and 12 business class seats. The 737-400s will continue to be used on Vientiane-Bangkok, which was Lao Central’s launch route and is now served with nine weekly frequencies, and Vientiane-Luang Prabang, which launched in mid-2012 with four weekly frequencies and was upgraded in early Jan-2013 to daily. The carrier is considering adding more 737-400s to supplement the new Superjet 100s, which will be used to open new international and domestic routes. Lao Central also has opportunities to increase capacity using its existing two 737-400s as its current schedule only requires one aircraft. The initial seven months was seen as a start-up phase in which it focused on establishing a reliable operation rather than pursue ambitious expansion. The carrier has the funds to be patient as it is part of the Phongsavanh Group, a large conglomerate of companies which includes one of the country’s biggest banks. Potential new international markets identified by Lao Central include Phnom Penh and Siem Reap in Cambodia, Hanoi in Vietnam, Yangon in Myanmar and Kunming in China. All these markets are currently served by other carriers except for Yangon but Lao Central is confident there is sufficient demand to support multiple carriers. Lao Airlines and China Eastern currently serve the Vientiane-Kunming route while Vietnam Airlines now serves Phnom Penh and Hanoi from Vientiane. Vietnam Airlines, which is now by far the largest foreign carrier in Laos, also serves Siem Reap and Hanoi from Luang Prabang. Vietnam Airlines has the flexibility to serve Laos from Cambodia and could launch service between Laos and Myanmar because of a four-way open skies agreement between Vietnam, Laos, Cambodia and Myanmar which allows unlimited fifth freedom rights within the countries. This is a huge advantage for Vietnam Airlines as it is by far the largest and strongest carrier in these four countries. Vietnam Airlines dominates the Cambodian market and has a 49% stake and full control of flag carrier Cambodia Angkor Air. Laotian carriers have traditionally struggled to compete against Vietnam Airlines and Thai Airways as the carriers are able to carry a large portion of passengers to and from Laos beyond their hubs. Lao Airlines codeshare with both carriers but Thai Airways and Vietnam Airlines are able to keep most long-haul passengers on their own Laos flights, leaving the flag carrier with lower yielding local traffic. Lao Airlines also has interline agreements with several European carriers serving Bangkok and is represented in Europe, but Bangkok Airways has much stronger partnerships with European as well as Middle Eastern carriers. The flag carrier also has had little success so far in developing interline agreements with carriers in Singapore, which it began serving with the hope of developing an alternative transit hub for passengers heading to Australia and Europe. The challenge of competition with foreign carriers will likely intensify as more foreign carriers start to serve Laos. As inbound tourists account for the majority of traffic on most current and potential international routes, foreign carriers will have an inherent advantage on any route they launch as they will be able to promote their Laos services through their local travel agent networks. Foreign carriers are also much bigger and enjoy economies of scale and purchasing power that Laotian carriers will never be able to achieve. The Luang Prabang international market will particularly be challenging for Laotian carriers as Luang Prabang is a tourist town which has an even higher portion of inbound traffic than the capital Vientiane, where there is a more even, although still not equal, mix of tourist/business and inbound/outbound traffic. Luang Prabang is also a seasonal market, which gives foreign carriers a further advantage as they can easily operate from their hubs in the peak northern hemisphere winter months and use the same aircraft for other markets during the off-peak summer months. Recognising these challenges, Lao Central and Loa Airlines are both focussing on expanding their international operations at their Vientiane hubs while offering domestic connections to Luang Prabang. Lao Airlines will continue to offer niche international routes at Luang Prabang, where it currently offers daily service to Bangkok and Chang Mai in Thailand as well as three weekly flights to Hanoi and two weekly flights to Jinghong in China. But as it continues to add medium-haul routes to North Asia and potentially Indonesia and the Philippines the focus will be Vientiane. Luang Prabang, however, will likely start to receive new international routes from foreign carriers to countries such as China, Singapore and South Korea after its new international terminal opens. A new terminal is expected to be open in mid-2013 but most new services will likely not begin until the end of 2013 as most of the foreign carriers evaluating the Luang Prabang market are considering seasonal services at least initially. Thai Airways, for example, is aiming to serve Bangkok-Luang Prabang on a seasonal basis. It will likely use its new regional unit Thai Smile, which operates A320s, on the route. Thai Airways was initially hoping to launch service to Luang Prabang in the current northern hemisphere winter season but this is now unlikely to occur as Laos authorities prefer to wait for the new terminal before authorising any additional services at the Luang Prabang airport. Bangkok Airways and Lao Airlines may also be enticed to upgrade their services on the Bangok-Luang Prabang to A320s, particularly during high season. Bangkok Airways now serves Luang Prabang with two ATR 72 flights during the peak winter months and one ATR 72 flight during the summer while Lao Airlines has one daily year-round ATR 72 frequency. The Luang Prabang airport can now handle A320s as a runway extension project was completed in 2012, but the current terminal is very small and cannot handle a large throughput of passengers, particularly international passengers. For now the airport is handling a limited number of domestic jet flights. Lao Central this week upgraded its Luang Prabang 737-400 service from four weekly flights to daily. Lao Airlines up-gauged in 2012 one of its daily Vientiane-Luang Prabang frequencies to A320s. It currently also operates 17 weekly ATR 72 frequencies on the route, some of which could be later up-gauged to A320s. Lao Airlines has significantly grown its domestic capacity over the last 15 months but, with the exception of some Vientiane-Luang Prabang frequencies, the A320 is seen as too large for domestic routes. Lao Airlines operated the A320 in late 2012 and early 2013 on some frequencies between Vientiane and Pakse, its second largest route. But while the Pakse airport is large enough to accommodate A320s the market proved too small and Lao Airlines now serves Vientiane-Pakse with 17 weekly ATR 72 frequencies. As it introduces the smaller Superjet 100, Lao Central similarly plans to focus primarily on international expansion as there are a limited number of domestic markets that can support even a 93-seat jet. Most domestic routes in Laos are not only thin but also have low yields, making turboprops a more viable option. Lao Central expects to only operate a couple of domestic routes with the Superjet 100. The carrier has not yet finalised any plans for new domestic routes but Vientiane-Pakse is the most likely option. Pakse is the second largest city in Laos but its international airport is served by only one carrier, Lao Airlines. Savannakhet, the third largest city in Laos which also has an airport with domestic and limited international services (Bangkok) from Lao Airlines, could also potentially support service from a second carrier. While there are opportunities domestically and with local international traffic, Laos remains an undeveloped and relatively poor country. Laos’ GDP is only about USD7.3 billion. Most of the population, which is about 6.3 million people, cannot afford to fly. Those that do fly primarily only fly domestically, where fares are kept low for locals. Although higher yielding tourist traffic will increase on some rural routes as tourism in remote areas of Laos opens up, the domestic market will likely continue to need subsidies to be viable, with the exception of a few trunk routes such as Vientiane-Luang Prabang and Vientiane-Pakse. Given the small size of the country’s main cities and the small size of its middle class, the Laos domestic market will also not likely be able to support low-cost carriers in the foreseeable future. There would be opportunities to stimulate international traffic with LCCs but Laos authorities at least for now are not keen to see a major expansion of LCC services. AirAsia currently serves Vientiane from Kuala Lumpur, a route which was previously unserved and is not currently served by any other carrier. AirAsia Malaysia was able to boost frequency on the route from three weekly flights to daily in May-2012 but its sister carrier Thai AirAsia has been repeatedly rejected in attempts to enter the bigger Bangkok-Vientiane route. When a designation for a second Thai carrier became available after Lao Central became the second Laotian carrier on the route, Bangkok Airways was authorised over Thai AirAsia. Laos authorities fear LCCs would impact the profitability of local carriers on their most important route, Bangkok. Laos authorities would likely have a similar response to LCCs seeking to serve other Lao Airlines routes such as Vientiane-Singapore or Vientiane-Hanoi although for the most part such routes probably remain too small for LCCs. LCCs, particularly AirAsia Malaysia and Thai AirAsia, would also be potentially interested in serving Luang Prabang. But even with the newly extended runway and new terminal being able to theoretically support LCCs, Laos authorities are reluctant to pursue rapid international traffic growth at Luang Prabang, which is a UNESCO heritage site. Laos currently has a LCC penetration rate of 8%, which is the lowest among all ASEAN countries. With nearly all of the expansion expected to come from full-service carriers, the country’s LCC penetration rate will likely drop rather than increase. The only other LCC serving Laos currently besides AirAsia is Korea's Jin Air, which follows more of a hybrid model. The Korean Air subsidiary launched service to Vientiane in early 2012 and currently operates the route with four weekly flights, according to Innovata data. Jin Air is only the second North Asian carrier serving Laos after China Eastern, which launched service to Vientiane from Kunming in late 2011 and upgraded the route to daily at the end of Oct-2012. Previously only Lao Airlines served the Vientiane-Kunming route, which it upgraded to A320s at about the same time China Eastern entered. As a result of the entry of Jin Air and China Eastern as well as the recent launch of services to Guangzhou, Busan and Seoul by Lao Airlines there has been a huge uptick in Laos-North Asia capacity. There is currently about 4,000 weekly one-way seats from Laos to North Asia, compared to only about 500 seats in Oct-2011. More capacity to North Asia is expected to be added over the next year as Lao Airlines looks to launch services to Japan (Fukuoka, Osaka and Tokyo Narita are all under consideration) and several North Asian carriers including Asiana look to serve Laos. Southeast Asia still accounts for about 80% of international capacity to and from Laos but there are huge opportunities in North Asia for inbound tourism. China in particular has emerged as an important market and accounted for about 150,000 of tourist arrivals in 2011. There are also increasing business ties between Laos and both China and South Korea. Links to North Asia hubs also open better connections to the North America market. There were only 70,000 tourist arrivals from the Americas in 2011 but this market is expected to grow rapidly. Laos has huge potential for tourism, particularly eco-tourism, from all major markets including Asia, Europe and North America. Laos is increasingly becoming more well known as a tourist destination and its exposure will increase significantly on 17-Jan-2013, when the one week-long ASEAN Tourism Forum takes place in Vientiane for the first time, bringing several hundred leading international travel agents to the country. The Laos capital has also become a popular convention site in recent years and its hosting in Nov-2012 of the 9th Europe-Asia Summit Meeting of Heads of State and Government (ASEM9) brought significant high-profile attention to the country. It remains to be seen if the capacity that has been added is sustainable and if Laos is big enough to support two international carriers. Even with just the two A320s added by Laos Airlines in late 2011 there were doubts that the carrier had the traffic for the jets as a prior attempt to lease in a single A320 in the middle of last decade ended miserably with the aircraft being returned after only one year. More doubts surfaced as the small flag carrier confidently and quickly committed to adding another two A320s before it had a chance to prove the capacity from the initial two aircraft had been successfully absorbed. Indeed, there have been some growing pains and the only new Lao Airlines route which has been operating for more than a few months, Vientiane-Singapore, has struggled. It is too early for any indications on the success of Guangzhou, Busan or Seoul as they were all launched within the last couple of months. But Lao Airlines remains confident in all of its new routes and in the Singapore market, where it added a fourth weekly flight in late Oct-2012 aiming to attract more business and transit traffic with the increased schedule. In addition, the key Vientiane-Bangkok market is suffering from over-capacity, which has particularly impacted Lao Central. But the carrier was expected to be unprofitable during its start-up phase and remains confident the fledgling Laos market can support two local carriers. 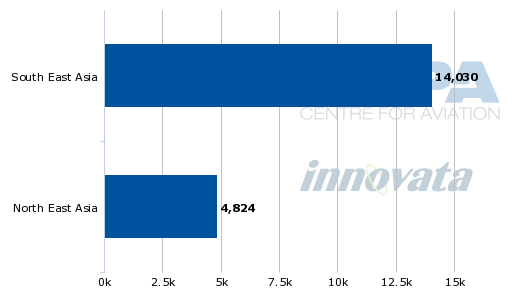 The Laos market, even with the huge capacity growth recorded over the last 15 months, remains very small. If the country succeeds at growing tourism, the capacity being added should be sufficiently absorbed in the medium-term. Local airlines will likely struggle to turn profits but at this point facilitating the development of the country, tourism growth and a bigger international profile are the priorities. As Vientiane and Luang Prabang start to receive more new air links to destinations throughout Asia, there will be an immeasurable positive impact on the Laos economy.